If these don't answer your question, check out the contact details below. Either enter a term describing your washing machine or washer dryer issue ('drum', 'wash time', 'cold fill' etc) into the search box then 'Go' or use the FAQs below to find your solution. Has the correct programme been selected and started? Has the start/pause button been pressed? Does your appliance have a delay timer and has it been set? If this hasn't resolved your problem, please email us on customercare@servis.co.uk. Please provide your product type and model as well as stating the problem. Alternatively you can call us on 0333 577 7232 (Monday - Friday, 9am - 5pm). Why is my machine not emptying or spinning? My washing machine is not taking in water, why? Why can’t I see any water in the drum during washing? Why is my fabric conditioner not emptying? Why is there black build up in the detergent drawer? Why does my washing feel harsh? Why is my washing machine vibrating or making excessive noise? My machine is displaying error code E01, E02, E03 OR E04, what does that mean? Why did the spin cycle on my machine not take place? The washing machine has a built in sensor which can stop spinning if it detects an out of balance load. This is a technology to protect garments and prolong the life of your machine. Avoid small wash loads containing items that could become heavy through water absorption. Why is the wash time on my new machine longer than on my old machine? As well as giving excellent cleaning results, Servis is committed to saving you money. A+++ rated machines achieve better results than lower rated machines because their gradual heating draws less power. Laundry soaks longer, so needs 15% less water. That’s 15% less running through your water meter. Slower heating means 50% less energy used than during the rapid heating in short wash cycles. 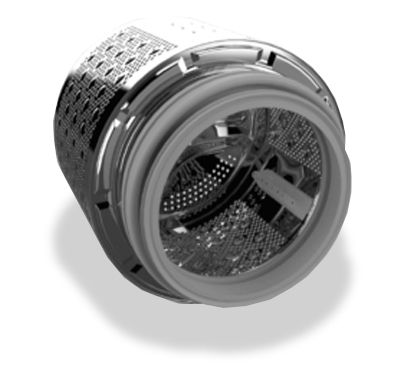 When you need a faster wash time, alternative programmes allow the selection of a quicker wash, putting temperature and spin speed controls at your fingertips. Where can I find the serial number on my washing machine? For your convenience the serial number is located above the door port hole. Why does the duration of my programme differ from that shown in the specifications? Durations vary according to wash load (weight and type), tap water, ambient temperature and selected extra functions. Temperatures can vary depending on the heating time. Make sure you switch on at the mains first, select the correct wash programme, then add the clothes to the drum, close the door and press “START”. My clothes are wet or not dry enough when programme ends. Depending on the programme selected some final spin speeds are slow (800rpm) to protect the fabric and to avoid creasing. If the fabric can take a faster spin you are able to select a separate spin through programme options. Check the blue hose on your mains connection tap is sealed. Check that the pump filter is securely closed. Either enter a term describing your fridge, freezer or fridge freezer issue ('door', 'light', 'temperature' etc) into the search box then 'Go' or use the FAQs below to find your solution. My appliance does not work, what should I do? There are a number of reasons why this may be happening. The appliance is switched on. If it is, you may need to change the bulb. Please consult your user manual for instructions. Why is my fridge/freezer making noises? It is not unusual to hear noises from cooling appliances, especially when the appliance is switching on or off. Why is the floor of the main fridge section wet? This could be because the condensation water drainage channel normally located at the rear of the fridge is blocked. Dry the bottom of the fridge and clean the drainage channel and the outlet hole with a cotton bud or similar item. You can avoid this problem by cleaning the drainage channel regularly. It is normal to see droplets of ice or water on the rear wall of a refrigerator. Moisture accumulates and becomes drops of water which will then freeze. When the auto defrost operates the ice will melt and run down the rear wall into water drainage channel. Make sure that nothing in the fridge touches the rear wall or they are likely to become wet. Why is there a bad smell in my fridge? To remove the smells, thoroughly clean the interior of your fridge and sterilise it, first ensuring that your appliance is isolated from the mains supply. An audible signal has sounded, what does it mean? Can the doors of the integrated fridges and freezers be reversed to suit my installation requirements? How can I make sure my fridge/freezer runs efficiently? Install the appliance correctly away from heat sources or direct sunlight in a well ventilated room. Always follow the installation instructions provided with the appliance. Ensure you use the correct temperature settings. Very low temperature settings consume a lot of energy but will not improve or lengthen the storage life of the food, and can also spoil vegetables, cold meats and cheese. Do not overfill the appliance. Proper food storage requires good air circulation. Overfilling prevents this and can cause your compressor to overwork using more energy. Only leave the door open as long as necessary. Every time you open the doors you loose cold air which means that the fridge/freezer will have to work harder to restore the correct temperature. Ensure the door shut correctly and check your door seals regularly. Keeping them clean ensures that they fit closely against the door. Never put hot foods into your fridge. Allow food to cool to room temperature before storing. Check for the build-up of any ice on your freezer walls. When the frost becomes too thick, defrost immediately following the instructions in your user manual. The doors can be opened to a maximum of 120 degrees (297mm of empty space is needed from the most outer side of the body), the door will open to 90 degrees without any extra space required. Either enter a term describing your cooker issue ('door', 'light', 'fuse' etc) into the search box then 'Go' or use the FAQs below to find your solution. What is the best way to clean my oven interior? CAUTION: please make sure the oven is disconnected from the electrical supply and the oven is cool before carrying out any cleaning of the oven. Try to clean the oven every time after use as this will make it easier to remove dirt and grease and ensure that deposits do not build up. Before applying any cleaning products to the inside of your oven, please consult your user manual for the correct cleaning procedure, as this can vary depending on the ovens features. Oven cleaning products can be purchased from your local supermarket - always follow the manufacturer's instructions. What is the best way to clean my stainless oven exterior? The Stainless steel exterior of your oven is best cleaned with an "E-Cloth" (micro-fibre textured cloth) and water. Spray the surface of the stainless steel with water (use a plant-mister) and wipe surface with E-Cloth in the same direction as the grain of the steel. Never use aggressive cleaners or solvents otherwise you may damage the surface. Incorrect shelf positions - make sure you use the correct temperatures and the shelf positions are correct. Blown bulb - replace the oven light bulb. Check your user manual for replacement bulb details and instructions on how to change the bulb. If the element still won't operate it could be due to an element failure or faulty control thermostat. In this case, please contact a qualified repairer. Why is my oven not operating? Is there any power to the oven? - Check the socket for power and check for a tripped circuit breaker or a blown fuse. Is it because of the digital clock settings? - If the digital clock is flashing and showing 3 zeroes, the power supply to the oven has been interrupted and the clock must be reset. Is it because of the timer settings? - If the timer has been set the oven display will show "AUTO". To operate the oven in manual mode without using the timer, the "auto" indicator must be deactivated, please consult your user manual for instructions. Should I open or close the oven door when using the grill? Most fanned ovens require closed door grilling as this will give the best cooking results. However, please check your user manual for the correct way to operate and use the grill. Why does my oven smoke when I turn the grill on? This is normally caused by fat deposited onto the grill element when fatty foods such as a roast are cooked in the oven. This means that when the grill is turned on the fat will burn off. If your oven has closed door grilling, leave the oven door closed during the grill warm-up (for 5 - 10 minutes) which should dissipate most of the smoke. A fan continues to run after I have finished cooking and switch off my oven, why is this? There is a cooling fan behind the control panel of your oven, this will continue to run for a while after the cooking process is complete in order to assist in cooling the oven more quickly, once the oven reaches a safe temperature the fan will automatically switch itself off. I have just installed a new oven and switched it on for the first time, there is a nasty smell coming from the oven, what is it? We recommend that before using the oven for the first time clean the interior of the oven thoroughly with liquid detergent and lukewarm water. Wipe off, then heat the oven to maximum and leave on for 20 minutes. This will ensure that residual oil and grease used in the manufacturing process is burned off and the oven will not give off unpleasant smells. Can I install a single electric oven into a tall housing unit? Yes, as long as the installation and ventilation instructions are followed. Please check the installation instructions in the user manual for full details. What are the advantages of fan oven cooking? This function provides even cooking of food and allows different kinds of food to be cooked simultaneously on different shelves and gives faster and more economical operation. What fuse rating is required for an electric oven? Most single electric ovens require a 13 amp fuse rating, whereas most double ovens require a 30 amp fuse rating. Please check the technical specification for each model found in the user/installation manual. This is normally located behind the main oven door. Check the frame behind the door, the sides of the door or it may possibly be located inside near the hinges. Please check your user manual which should carry the model number of the product or note this down when the product is being installed. Our customer support team will require this number if you need to call out an engineer. Either enter a term describing your dishwasher issue ('start', 'smell', 'knocking' etc) into the search box then 'Go' or use the FAQs below to find your solution. How can I ensure my dishwasher runs efficiently? When possible, skip the drying cycle by leaving the door open when the wash cycle is complete; the air and residual heat will dry the dishes. Do not overdose with detergent, regenerating salt or rinse aid. For recommendations please consult your instruction manual and the manufacturer's instructions on the pack. Ensure that the water softener is set correctly. The tank is made of stainless steel and therefore any rust marks are due to external elements (fragments of rust from the water pipes, pots, cutlery etc). Special products are commercially available to remove such marks. Check that the amount of detergent being used is correct. Certain detergents are more corrosive than others. Check that the cap of the salt container is securely closed, and that the water softening setting is correct. Check whether spray arms are knocking against an item in a basket. If the source of noise cannot be determined, run a programme without crockery. If the noises continue, please contact our customer support team. Why is there a bad smell in my dishwasher? Smells in the dishwasher tend to be the result of food debris left within the appliance because of a poor or faulty house drainage system, incorrect installation of the dishwasher drain hose or some sort of blockage in the drain pump. To avoid this problem, it is good practice to run a dishwasher cleaner through the appliance every three months or so. These can be found in most supermarkets. Also regularly clean and wipe the edges of the door and the door seal, especially at the bottom of the door. Repeat the wash programme, if the problem continues contact the customer support team. Ensure the plumbing connections are in order and that the water supply is on. Please note of our comments in the user manual regarding combined (2-in-1, 3-in-1, etc) detergent products. The machine should be emptied soon after the programme ends otherwise moisture can re-condense back onto the dry items - especially if left overnight. Always empty the lower basket first; the upper spray arm will still have some water left in it which may drip onto items in the lower basket. How can I improve washing performance? Always scrape food remains off plates, utensils etc prior to placing in your dishwasher. Remove and clean the filters in the base of the interior and check the pump area for food debris. Remove the spray arms and check the jets for food particles - carefully remove any blockages being careful not to damage the jets. It can be beneficial to run a dishwasher cleaner though the machine once every two or three months. Please note our comments in the user manual regarding combined detergent products (2-in-1, 3-in-1, etc). Clean your appliance as described in the operating manual under "Cleaning". If the appliance continues to produce poor results, please contact our Customer Support team. Why do I get poor wash results? My dishwasher will not start. Are dishwashers hot or cold water fill? Why does the duration of my dishwasher programme differ from that shown in the specifications? All manuals for current products are available to download. To find your manual, click here. We’ve dug deep in the archives and rounded up the user manuals for as many older models as we could. 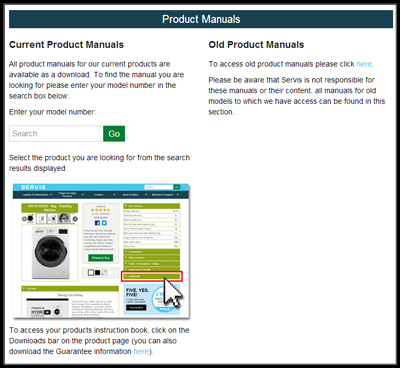 To find your manual for an older product, please click here. For spare parts availability and out of guarantee repairs, please click here to send a message. Please include the make, model, part, or problem for which you require help.